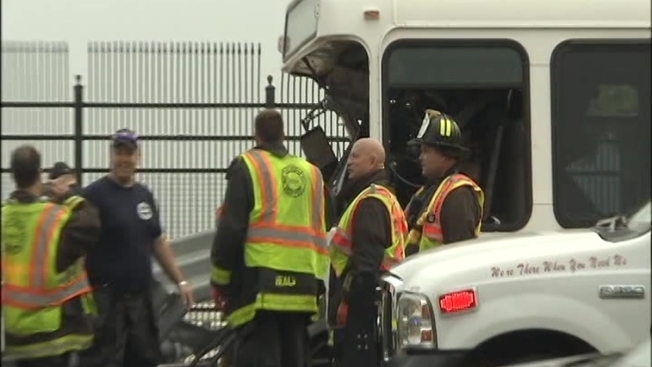 A bus driver has been cited after at least 15 people were injured when a shuttle bus crashed on Interstate 190 near O'Hare Airport Friday morning. The accident blocked traffic and forced some travelers to walk to the airport heading into one of the busiest travel weekends of the year. Queshonyas Eubanks, 43, was cited for failing to produce a driver's license and failing to remain in her lane. The shuttle bus crashed into a median around 6:30 a.m. just before Terminal 1, according to Chicago Police News Affairs Officer Jose Estrada. Police and fire officials, citing preliminary information, said 15 people were injured in the crash. Fire Chief Timothy Sampey said the driver of the bus was left pinned by the crash and rescued by an airport employee and a firefighter, who witnessed the accident while on his way to work. That firefighter, identified as Rory Williams, was also hurt during the rescue, but his injuries were non-life threatening, officials said. "He wouldn't stop [treating passengers] until he was ordered to go to the hospital," Sampey said. "It was unbelievable what they did," said firefighter Steve Siavelis, who was on the first truck to arrive at the scene. "People were thrown around the bus," he said. "Some were more critical than others." Fire officials said four people were transported in critical condition, five in fair-to-serious condition and four in good condition. Two people refused treatment. At least 10 ambulances were called to the scene and victims were reported to be taken to Our Lady of the Resurrection Medical Center, Resurrection Medical Center, Swedish Covenant Hospital, and Loyola University Medical Center. Sampey said fluids were leaking from the bus following the crash. Details surrounding the cause of the crash were not immediately available. With traffic blocked by the crash early Friday, some heading to the airport ditched cars and began walking along the freeway to the terminal. Sampey said several ambulances were delayed by passengers walking along the shoudler attempting to make their flight. "People were basically bailing on their vehicles in an effort to get to their flight," he said. "It’s understandable but at some point in time we had to gain control of them to get them off the shoulders where the emergency vehicles were trying to get to the scene." The crash threatened to snarl travel plans for some of the millions of people hitting the roads and sky for Labor Day weekend. The Chicago Department of Aviation expects to see more than 1.2 million passenger at O’Hare International Airport and Midway Airport in the days surrounding Labor Day weekend. Airport officials said Friday was set to be the busiest travel day of the holiday weekend with about 225,000 passengers traveling at O'Hare.